Every author dreams of the perfect place to write, a place where the creative juices flow while putting pen to paper or fingers to keyboard. Maybe it’s a cozy café in the middle of a bustling downtown metropolis. Perhaps it’s a secluded lodge high in the mountains with a sweeping alpine view. No matter the location, it’s inspiring to the scribes who help shape the lasting legacy of humanity. But Nadine Christian has everyone beat. She has an entire tropical island in the middle of the Pacific Ocean, with more palm trees than people. And it’s yielded some pretty spectacular literary fruit. Earlier this year, Christian became the first published author in the history of the Pacific territory of Pitcairn with the release of her debut novel, Remembering Love. The book, about a woman who returns to the island of her birth and the shocking secret she discovers, was an instant hit, becoming a 2013 Readers’ Favorite Silver Medal Winner. Now Christian is back — not just with one book, but an entire series. Enter the Bounty’s Retreat. The Bounty’s Retreat deals with the opening of a hotel — known as the Bounty’s Retreat — and airstrip on Pitcairn, and the lives of residents who are affected by them. The first book in the series, Quintal’s Return, was released Aug. 1, and focuses on hotelier Kate Quintal and her sister Jen, who are hired to run a new luxury hotel on Pitcairn. Leaving New Zealand to work at the hotel, Kate soon finds herself in a burgeoning romance with the burly and handsome Bryce Brown. But things aren’t all as they seem, as someone is trying to sabotage the hotel, forcing Kate to fight not only for her job and her heart, but her very life. The second title in the series is the somewhat mysteriously named Home Again, Home Again. Released Nov. 1, aircraft engineer Tina finds herself being swept off her feet by dashing pilot Blane Solis. But the blossoming romance is complicated by Tina’s childhood sweetheart Connor Brown, and a dark secret Blane is hiding. The series’ third book, Quintal’s Quandary, will focus on Kate’s sister, Jen, and her love interest. Like Remembering Love, Christian helps bring an island that 99.99 percent of the world’s population will never visit to life, showing readers a glimpse of the island through the thoughts and actions of strongly fleshed-out characters. The real-life Pitcairn may not have a hotel or airstrip (the only way tourists can get there is by boat), but the series offers a fascinating “what if” scenario. It’s similar to the Twilight series by author Stephanie Meyer, who through the vehicle of a paranormal romance showcased a possible future for the town of Forks, Washington if more development took place. GALO recently had a chance to catch up with Christian, who lives on Pitcairn with her husband, five children, four goats, two cats and thirty chickens, while somehow avoiding sunburn. Here’s what she had to say. GALO: Your first book, Remembering Love, has received quite a bit of attention and positive reviews, including the 2013 Readers’ Favorite Silver Medal Winner. Has that added any pressure on you for the Bounty’s Retreat series? Nadine Christian: Remembering Love was actually the second book I wrote, the first to be picked up. Quintal’s Return was the very first novel I ever wrote, and it kept on getting rejected — until some brave soul told me why. It was utter rubbish, and how dare I write about… They went on for a page and a half about how awful it was and why. I immediately deleted the e-mail and walked away. How dare they? I was so hurt and insulted. A couple of months later after the fuss of Remembering Love’s release died down, I took a second look at Quintal’s with fresh eyes — with that critiquing email in mind. I ended up completely rewriting it. So, I guess any pressure for the start of this series was mine of the making. The harsh e-mail was actually the rebirth of a better novel, and the beginning of a series. GALO: Other than the plots, of course, how would you say the Bounty’s Retreat series differs from Remembering Love? 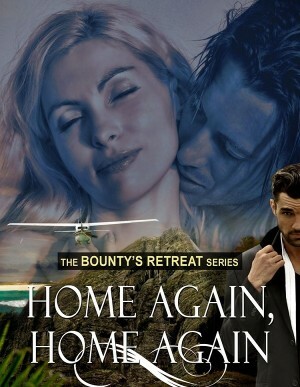 NC: The Bounty’s Retreat series revolves around the construction of an airport and luxury hotel on Pitcairn and the changes it makes on the island. We have neither on [the] island, but I think that the birth of such a hotel destination would be a boon to the island — and so do the characters! I’ve drawn on humor as well as used a bit of darkness with my evil character. Remembering Love was set more in contemporary Pitcairn, with descent into mystery and searching for a past forgotten. It’s very dark, I’d say. GALO: In your opinion, how is writing a series different than a standalone novel? NC: It’s both easier and harder! Easier because once that first novel was written and I had a character base, I could draw on those people right [all] the way through as I wrote. Harder because I had to stay within the parameters I’d already set with a hotel and airport. I still managed to have fun with it!